waveslease.com has just sent Payment #25 to lessors, for blocks 1255469 -> 1265400 (55 Blocks mined). A total of 31.45 WAVES, 425.95 MRT + extra 123 MRT to WLLT holders, 550 WLLT has been distributed . Payment #26 will be sent on 24th November. waveslease.com has just sent Payment #26 to lessors, for blocks 1265001-> 1276410 (62 Blocks mined). A total of 17.54532 WAVES, 431.96 MRT + extra 123.09 MRT to WLLT holders, 620 WLLT has been distributed . waveslease.com has just sent Payment #27 to lessors, for blocks 1276411-> 1286679 (52 Blocks mined). A total of 42 WAVES, 346.72 MRT + extra 98.97 MRT to WLLT holders, 520 WLLT has been distributed . waveslease.com has just sent Payment #28 to lessors, for blocks 1286680-> 1297022 (57 Blocks mined) . A total of 3.6824273 WAVES , 365.94 MRT + extra 122.022 MRT to WLLT holders, 570 WLLT has been distributed. Jackpot assets are held on the WLLT cold wallet. Note: we found out that 218.2 MRT were wrongly distributed to the WLLT cold wallet. MRT has been returned to the node and will be included in payment #29. Payment #29 will be sent on 15th December. Dear Lessors, please be informed that due to personal errands, Payment #29 and snapshot of WLLT richlist will be made on Saturday 15th at 17:00 GMT+1 . waveslease.com has just sent Payment #29 to lessors, for blocks 1297023 -> 1307143 (70 Blocks mined) . A total of 9.052 WAVES , 538.99 MRT + extra 179.65 MRT to WLLT holders, 700 WLLT has been distributed. Jackpot contains 1.334 WAVES and 150.86 MRT stored in the WLLT cold wallet. Payment #30 will be sent on 2nd January. Dear Lessors, here is the list of the Participants to the December 2018 Extraction. A random number has been associated to each address owning at lease 2 WLLT, accordingly to the data found on dev.pywaves on 15th December 17:00. For further details about the estraction works please read this document. waveslease.com has just sent Payment #30 to lessors, for blocks 1307143 -> 1333123 (192 Blocks mined) . A total of 16.14 WAVES , 1094.4 MRT + extra 3.63 (1) MRT to WLLT holders, 1920 WLLT has been distributed. (1) Only 3,63 out of 364.96 MRT has been distributed due to an error in the distribution script. 361.33 MRT will be reserved for WLLT holders in payment #31. Payment #31 will be sent on 5th January. 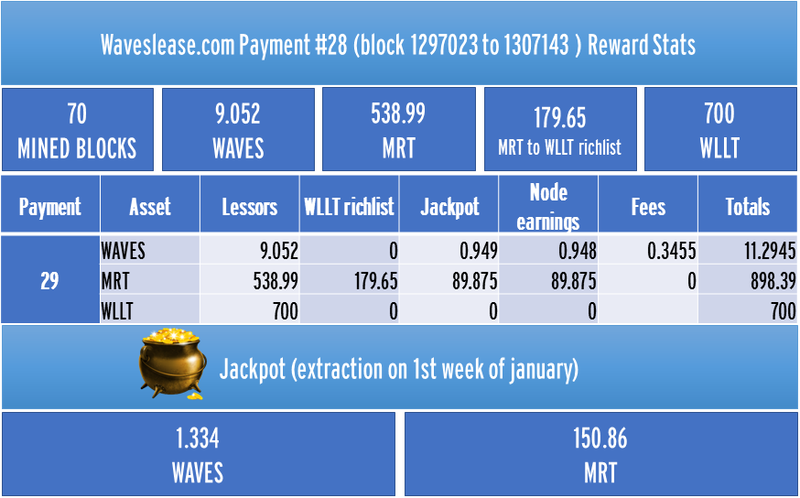 After this payment, jackpot contains 3.24314 WAVES and 333.34 MRT stored in the WLLT cold wallet. Winning number will be taken from the Oracle data transaction with basedOnBlockHeight = 1376417 . In case the data transaction will not exist, the extraction will be based on the 1st transaction with basedOnBlockHeight > 1376417. Please refer to How to win jackpot for further details. waveslease.com has just sent Payment #31 to lessors. WLLT distribution has been raised from 10 WLLT to 20 WLLT per Block. Payment #32 will be sent on 12nd January. We realized we computed incorrectly the block for the oracle, block 1376417 will be mined to far in the future. The winning number will be taken from the 1st Oracle data transaction with basedOnBlockHeight > 1338914. Dear Lessors, apologies but the Tradisys Oracle stopped to work on 3rd January, therefore to extract the winning number for the 2018 December Extraction we will strip the alphanumeric of block 1341885 (should be mined tomorrow). Stripping the signature will give the number 319926767275786 therefore the winning number is 86 and the 2018 December Extraction winner - accordingly to this post - is address 3PMDs4E33jbGXZNUQCb1N1TfAR1kEJAj7w7, that will receive today 3.24314571 WAVES and 333.34 MRT. waveslease.com has just sent Payment #32 , covering blocks from 1337475-1347800 ( 67 blocks were mined). A total of 2.5162 WAVES have been distributed to lessors . A total of 476.14 MRT have been distributed to lessors , 135.72 MRT have been distributed to WLLT holders . 1340 WLLT have been distributed to lessors . Payment #33 will be sent on 19th January . waveslease.com has just sent Payment #33 , covering blocks from 1347801-1357983 ( 63 blocks were mined). A total of 7.72703 WAVES have been distributed to lessors . A total of 453.33 MRT have been distributed to lessors , 129.33 MRT have been distributed to WLLT holders . 1260 WLLT have been distributed to lessors . Payment #34 will be sent on 26th January . waveslease.com has just sent Payment #34 , covering blocks from 1357984-1368102 ( 58 blocks were mined). A total of 4.29071 WAVES have been distributed to lessors . A total of 506.02 MRT have been distributed to lessors , 144.28 MRT have been distributed to WLLT holders . 1160 WLLT have been distributed to lessors . waveslease.com has just sent Payment #35 , covering blocks 1368103-1378364 (47 blocks mined). A total of 4.75895 WAVES have been distributed to lessors . A total of 367.25 MRT have been distributed to lessors , 104.55 MRT have been distributed to WLLT holders . 940 WLLT have been distributed to lessors . Get more MRT thanks to WLLT! waveslease.com has just sent Payment #36 , covering blocks 1378365-1388491 (53 blocks mined). A total of 5.91024 WAVES have been distributed to lessors . A total of 309.23 MRT have been distributed to lessors , 88 MRT have been distributed to WLLT holders . 1060 WLLT have been distributed to lessors . Payment #37 will be sent on 16th February. waveslease.com has just sent Payment #37 , covering blocks 1388492-1398472 (49 blocks mined). A total of 5.64907 WAVES have been distributed to lessors . A total of 536.41 MRT have been distributed to lessors , 156 MRT have been distributed to WLLT holders . 960 WLLT have been distributed to lessors . Payment #38 will be sent on 23th February. WLLT is a waves asset that is distributed by waveslease.com node to his lessors for each mined block and represent the loyalty of a leaser to the node : the longer you keep your WAVES leased to the node, the more WLLT you will accumulate. Please find some important changes about MRT Distribution and WLLT token. We have currently distributed 18.139 WLLTs. Distribution rate of WLLT token will remain fixed in 2019 and be equal to 20 WLLT per block mined. The node currently has about 270K leased waves and is mining on average 50 blocks per week so we expect to distribute around 48.000 WLLT per year. 20% MRT will be used for a buyback and burn process. In this way we give WLLT holders two options: they may decide to hold the tokens for receiving extra MRTs or to sell them on DEX. WLLT bought on DEX will be burned. Every week, 20% of received MRT will be sold for WAVES and deposited in the WLLT treasury cold wallet: 3PCQiEJsERrUyrVV2551MNs4eSDAhgQg5e4. Every month, a buy wall will be put on DEX in the market WAVES/WLLT. The WLLT bought by the node will be burned. waveslease.com has just sent Payment #38 , covering blocks 1398473-1408953 (61 blocks mined) . A total of 6.39102 WAVES have been distributed to lessors . A total of 255.2 MRT have been distributed to lessors , 72.54MRT have been distributed to WLLT holders . Apparently Waves team did not sent the correct amount of MRT. The missing MRT will be included in the next payment. 1220 WLLT have been distributed to lessors . Payment #39 will be sent on 2nd March. waveslease.com has just sent Payment #39 , covering blocks 1408954-1419227 (64 blocks mined) . A total of 10.37046 WAVES have been distributed to lessors . A total of 527.23 MRT have been distributed to lessors , 150.19 MRT have been distributed to WLLT holders . 1280 WLLT have been distributed to lessors . Payment #40 will be sent on 9th March. We remind that from payment #40, a new distribution of dividends policy will be followed. Please follow this link for more details. 142.94 MRT has been saved at address 3PCQiEJsERrUyrVV2551MNs4eSDAhgQg5e4 for end-of-month buyback. Payment #41 will be sent on 16th March.